If you are a developer writing applications that use SQL Server and you are wondering what exactly happens when you ‘run’ a query from your application, I hope this article will help you write better database code and will help you get started when you have to investigate performance problems. This request type contains a procedure identifier to execute, along with any number of parameters. Of special interest is when the procedure id will be 12, ie. sp_execute. In this case the first parameter is the T-SQL text to execute, and this is the request that what your application will send if you execute a SqlCommand object with a non-empty Parameters list. If you monitor using SQL Profiler you will see an RPC:Starting Event Class. Bulk Load is a special type request used by bulk insert operations, like the bcp.exe utility, theIRowsetFastLoad OleDB interface or by the SqlBulkcopy managed class. Bulk Load is different from the other requests because is the only request that starts execution before the request is complete on the TDS protocol. this allows it to start executing and then start consuming the stream of data to insert. After a complete TDS request reaches the database engine SQL Server will create a task to handle the request. The list of requests in the server can be queried from sys.dm_exec_requests. The above mentioned task created to handle the request will represent the request from beginning till completion. For example if the request is a SQL Batch type request the task will represent the entire batch, not individual statements. Individual statements inside the SQL Batch will not create new tasks. Certain individual statements inside the batch may execute with parallelism (often referred to as DOP, Degree Of Parallelism) and in their case the task will spawn new sub-tasks for executing in parallel. If the request returns a result the batch is complete when the result is completely consumed by the client (eg. when you dispose the SqlDataReader). You can see the list of tasks in the server by queryingsys.dm_os_tasks. When a new request reaches the server and the task is created to handle that request, in PENDING state. At this stage the server has no idea yet what the request actually is. The task has to start executing first, and for this the engine must assign a worker to it. Workers are the thread pool of SQL Server. A number of workers is created initially at server start up and more can be created on-demand up to the configured max worker threads. Only workers execute code. Workers are waiting for PENDING tasks to become available (from requests coming into the server) and then each worker takes exactly one task and executes it. The worker is busy (occupied) until the task finishes completely. Tasks that are PENDING when there are no more available workers will have to wait until one of the executing (running) task completes and the worker that executed that task becomes available to execute another pending task. For a SQL batch request the worker that picks up that task will execute the entire SQL batch (every statement). This should settle the often asked question whether statements in a SQL batch (=> request => task => worker) can execute in parallel: no, as they are executed on a single thread (=> worker) then each statement must complete before the next one starts. For statements that internally use parallelism (DOP > 1) and create sub-tasks, each sub-task goes through exactly the same cycle: it is created as PENDING and a worker must pick it up and execute it (a different worker from the SQL batch worker, that is by definition occupied!). The lists and state of workers inside SQL Server can be seen by querying sys.dm_os_workers. Once a task started executing a request the first thing it needs to do is to understand the content of the request. At this stage SQL Server will behave much like an interpreted language VM: the T-SQL text inside the request will be parsed and an abstract syntax tree will be created to represent the request. The entire request (batch) is parsed and compiled. If an error occurs at this stage, the requests terminates with a compilation error (the request is then complete, the task is done and the worker is free to pick up another pending task). SQL, and T-SQL, is a high end declarative language with extremely complex statements (think SELECT with several JOINs). Compilation of T-SQL batches does not result in executable code similar to native CPU instructions and not even similar to CLI instructions or JVM bytecode, but instead results primarily in data access plans (or query plans). These plans describe the way to open the tables and indexes, search and locate the rows of interest, and do any data manipulation as requested in the SQL batch. For instance a query plan will describe an access path like 'open index idx1 on table t, locate the row with the key 'k' and return the columns a and b'. As a side note: a common mistake done by developers is trying to come up with a single T-SQL query that cover many alternatives, usually by using clever expressions in the WHERE clause, often having many OR alternatives (eg. (COLUMN = @parameter OR @parameter IS NULL). For developers trying to keep things DRY and avoiding repetition are good practices, for SQL queries they are plain bad. The compilation has to come up with an access path that work for any value of the input parameters and the result is most often sub-optimal. I cannot close this side without urging you to read Dynamic Search Conditions in T-SQL if you want to learn more about this subject. Speaking of choosing an optimal data access path, this is the next stage in the lifetime of the request: optimization. In SQL, and in T-SQL, optimization means choosing the best the data access path from all the possible alternatives. Consider that if you have a simple query with join between two tables and each table has an additional index there are already 4 possible ways to access the data and the number of possibilities grows exponentially as the query complexity increases and more alternative access paths are available (basically, more indexes). Add to this that the JOIN can be done using various strategies (nested loop, hash, merge) and you’ll see why optimization is such an important concept in SQL. SQL Server uses a cost based optimizer, meaning that it will consider all (or at least many) of the possible alternatives, try to make an educated guess about the cost of each alternative, and then choose the one with the lowest cost. Cost is calculated primarily by considering the size of data that would have to be read by each alternative. In order to come up with these costs SQL Server needs to know the size of each table and the distribution of column values, which is are available from the statistics associated with the data. Other factors considered are the CPU consumption and the memory required for each plan alternative. Using formulas tuned over many years of experience all these factors are synthesized into a single cost value for each alternative and then the alternative with the lowest cost is chosen as the query plan to be used. Exploring all these alternatives can be time consuming and this is why once a query plan is created is also cached for future reuse. Future similar requests can skip the optimization phase if they can find an already compiled and optimized query plan in the SQL Server internal cache. For a lengthier discussion see Execution Plan Caching and Reuse. 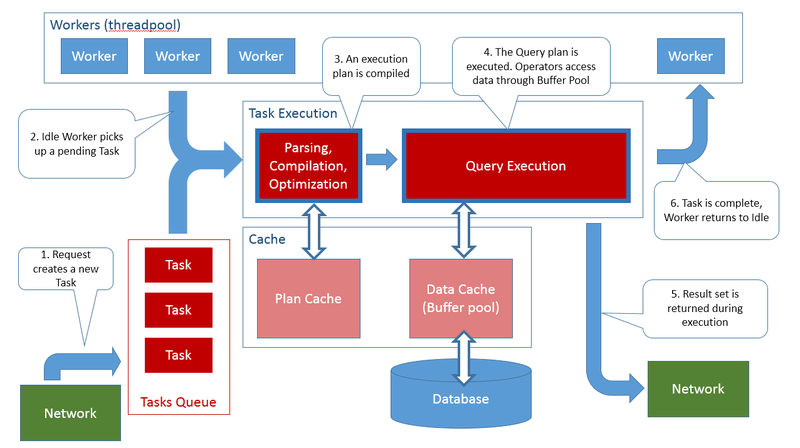 Once a query plan is chosen by the Optimizer the request can start executing. The query plan gets translated into an actual execution tree. Each node in this tree is an operator. All operators implement an abstract interface with 3 methods: open(), next(), close(). The execution loop consists in callingopen() on the operator that is at the root of the tree, then calling next() repeatedly until it returns false, and finally calling close(). The operator at the root of the tree will in turn call the same operation on each of its children operators, and these in turn call the same operations on their child operators and so on. At the leaf the trees there are usually physical access operators that actually retrieve data from tables and indexes. At intermediate levels there are operators that implement various data operations like filtering data, performing JOINs or sorting the rows. Queries that use parallelism use a special operator called an Exchange operator. The Exchange operator launches multiple threads (tasks => workers) into execution and asks each thread to execute a sub-tree of the query plan. It then aggregates the output from these operators, using a typical multiple-producers-one-consumer pattern. An excellent description of this execution model can be found in the Volcano-An Extensible and Parallel Query Evaluation System. This execution model applies not only to queries, but also to data modification (insert, delete, update). There are operators that handle inserting a row, operators that handle deleting a row and operators that handle updating a row. Some requests create trivial plans (eg. a INSERT INTO ... VALUES ...) while other creates extremely complex plans, but the execution is identical for all of the and occurs just as I described: the execution tree is iterated calling next() until its done. Some operators are very simple, consider for example the TOP(N) operator: when next() is called on it, all it just has to call next() on its children and keep a count. After N times being called, it simply return false w/o calling the children anymore, thus terminating the iteration of that particular sub-tree. Other operators have more complex behavior, consider what a nested loop operator has to do: it needs to keep track of the loop iteration position on both the outer child and inner child, call next() on the outer child, rewind the inner child and call next() on the inner child until the join predicate is satisfied (see Nested Loop Joins for a more thorough discussion). Certain operators have a stop-and-go behavior, meaning that they cannot produce any output until they consumed all the input from their own children operators. Examples of such operators is SORT: the very first call to next() does not return until all the rows created by the children operators are retrieved and sorted. An operator like HASH JOIN will be both complex and stop-and-go behavior: to build the hash table it has to call next() on the build side child until that operator returns false. It then calls next() on the probe side child operator until a match is found in the hash table, then return. Subsequent calls continue to callnext() on the probe side child operator and return on hash table match, until the probe side child operator next() returns false (see Hash Join for a more thorough discussion). Results are returned back to the client program as the execution proceeds. As rows ‘bubble’ up the execution tree, the top operator is usually tasked with writing these rows into network buffers and sending them to back to the client. The result is not created first into some intermediate storage (memory or disk) and then sent back to the client, instead it is sent back as is being created (as the query executes). Sending the result back to the client is, of course, subject to the network flow control protocol. If the client is not actively consuming the result (eg. by calling SqlDataReader.Read()) then eventually the flow control will have to block the sending side (the query that is being executed) and this in turn will suspend the execution of the query. The query resumes and produces more results (continue iterating the execution plan) as soon as the network flow control relieves the required network resources. An interesting case is OUTPUT parameters associated with the request. To return the output value back to the client the value has to be inserted into the network stream of data that flows from the query execution back to the client. The value can only be written back to the client at the end of execution, as the request finishes. This is why output parameter values can only be checked after all results were consumed. A heap is the table w/o any order defined on it. The heap contains all the columns of a table. If a table is organized as a heap then whenever you are talking about the ‘table’ then heap is the ‘table’. If you did not declare a PRIMARY KEY clause when you created the table then the table is a heap. A table created by a SELECT... INTO ... FROM ... statement will be a heap. For more details on how heaps are organized see Heap Structures. A clustered index is a table with an order defined on it. The clustered index contains all the columns of a table and if a table is organized as a clustered index then whenever you are talking about the ‘table’ the clustered index is the ‘table’. Clustered indexes are B-Trees. If you declare a primary key declared on a table then the same key is also used for the clustered index, unless the primary key is explicitly declared as NONCLUSTERED. For more details on how clustered index are organized see Clustered Index Structure. A nonclustered index is a copy of a subset of a table data with a specific order defined on it. A nonclustered index contains one ore more columns from the table. When talking about “indexes” on a table, most often the discussion refers to nonclustered indexes. Nonclustered indexes are B-Trees. For more details on how nonclustered indexes are organized see Nonclustred Index Structures. With SQL Server 2012 there is another mode of organizing a data, namely Nonclustered Columnstoresand in the next version of SQL Server there will also be a Clustered Columnstore mode. If you’re interested in them read the articles linked. The Scan operator will iterate through all the rows in its source. A scan can never locate a particular row, it always has to scan the entire data set (hence it’s name…). If you inspect an execution plan you’ll possibly see any of the operators for Clustered Index Scan, Nonclustered Index Scan,Table Scan, Remote Index Scan and Remote Scan. They are distinct operators because they apply to different data sources (indexes, tables, remote linked servers) but they all have in common the end-to-end scan behavior. As these operators have to read the entire data, always, they are always expensive. Only data warehousing queries should resort to these type of scans. The seek operator can locate a row directly based on a key. Seek can only operate on B-Tree organized data sources, so it can only be applied to Clustered and Nonclustered indexes. If an index has a complex key (multiple columns) then the Seek operator can only operate if values for the leftmost keys in the index definition are provided. To give an example, if an index has the key columns (A, B, C) then the Seek can locate the first row where A='a', or the first row where A='a' AND B='b' or the first row where A='a' AND B='b' AND C='c'. However, on such an index, Seek cannot locate a row where B='b' or a row where C='c'. Seek operator is also capable of implementing ranges. Given the same index definition on (A, B, C) a Seek operator can iterate all rows where A > 'a' AND A < 'z' or all rows where A = 'a' AND B > 'b' AND B < 'z', but it cannot iterate rows where B > 'b' AND B < 'z'. If you inspect an execution plan you will possibly see any of the operators Clustered Index Seek, or Remote Index Seek. They are distinct operators because they apply to different data sources, but they all have in common the capability to efficiently locate locate a row base dona key value or to iterate efficiently over a range of key values. Obviously there are no heap seek operators, as heaps, being unordered, do not have the capability to locate a row efficiently based on a key. Seek should be be the preferred data access method in almost every situation. Bookmark lookup is a special data access operator that can efficiently locate a row based on a special type of value, called a bookmark. You cannot provide boomarks, only the engine internally can retrieve bookmarks for later lookup. And this is the gist of this special operator: it is never the primary data access operator, it will always be an operator used to look up a row that was previously accessed one of the other operators, a Scan or a Seek. Bookmarks can be looked up on any data organization mode, both on heaps and or B-Trees. In an execution plan you may see an Bookmark Lookup, a Row ID Lookup (Heap specific look up) or a Key Value Lookup (B-Tree specific look up). · Scans read all the data. · Seek read only the minimum required data. · Heaps only support scans. · B-Trees can perform seeks only if the leftmost index key(s) are specified. Strictly speaking all the operators used to insert, delete or update rows are also data access operators. The Inserted Scan and the Deleted Scan operators do access data to iterate over the trigger inserted and deleted pseudo-tables.Log Row Scan is a more esoteric data access operator (it reads rows from the log, not from the data tables). But going into this level of detail to explain how these work would derail the purpose of this very article. Frequently you will see the concept of Range Scan being mentioned. This refers to a Seek operator that uses a seek to quickly locate a row by key and then it continues by iterating the rows from that position forward, sometimes up to a specific second key value. The Seek operator is performing a scan within the range defined by the start and end keys, hence the term Range Scan being used. If we look back at how query execution occurs we can now understand how the data access operators drive the entire query plan iteration. When the next() method is called on the operator at the root of the query tree the call percolates down from parent operator to child operator until it reaches a data access operators. These operators implement next() by actually reading the data from the underlying source (heap or B-Tree) and returning the row read. They remember the position of the row returned and subsequent call to next() reads the next row and return this next row. Data access operators do not have more child operators, they sit at the leaves of the query plan tree. Operators higher on the tree implement functionality like filtering row, joining tables, sorting results, computing aggregates and so on atop the data returned by the data access operators. The data access operators always read data from a cache, never from disk. This cache is called the Buffer Pool. If data is not present in the cache the data access operator must request it from the disk (issue a disk IO read) and wait until is fetched into the cache. Data in the cache (in the Buffer Pool) is shared between all queries so once fetched subsequent data access operators that have to read the same data will benefit from finding the data in the cache. SQL Server will read as much data into this cache as is possible, growing the process allocated private memory until all the memory on the system is allocated to SQL Server (subject to a max limit configured by changing the max server memory). The Buffer Pool cache, as well as the IO read/write requests do not handle individual rows but instead they always operate on a 8Kb page. · On first next() call the operator has to find the first row and return it. SQL Server stores metadata about tables that describe exactly which pages belong to a table, for more details I recommend reading Managing Space Used by Objects and Inside the Storage Engine: IAM pages, IAM chains, and allocation units. The data access operator will request a reference from the Buffer Pool for this page which will return a pointer to the in-memory copy of the requested page. If the page is not in memory, the request blocks until the page is read from disk. The page contains an array of individual data records. A record is not necessary an entire row, because large values and variable length values may be stored on another page. I recommend reading Inside the Storage Engine: Anatomy of a recordfor more details on how rows are arranged on the page. The data access operator will locate the first row on the page, copy out the requested field values and return. The data access operator keeps internal state that allows it to efficiently return to this position (same page and row). · Parent operators consume the first row returned by the data access operator. · When next() is called again on the data access operator it will use the previously established context state to position itself quickly on the current page and row, advance the row position by one, copy out the requested field values and return. · Parent operators consume the next row returned by the data access operator. · When next() is called again on the data access operator and all rows on the page have been consumed the operator will request from the Buffer Pool a reference for the next page. Which is the ‘next’ page is determined from the table metadata, and I refer you again to Paul Randal’s IAM articlefor more details. Once it has the next page the operator returns the first row on this new page (it copies out the request fields and returns). · Parent operators consume this row returned by the data access operator. · This continues until the last row on the last page belonging to the table is returned. After this the operator has reached end-of-table, it’s internal state is positioned ‘beyond end of table’ and cannot return any more rows. · When the data access operator cannot return any more rows the parent operator does whatever action it has to do when the child operators are ‘done’. For example a SORT operator can now start returning rows. A hash JOIN can start iterating the probe side and return rows. A SELECT operator can itself return false and cause further operators up the tree to finish, ultimately causing the query to complete. · Data access operators can be rewind. For example if our heap scan operator would be the inner side child of a nested loop operator, when is complete the parent nested loop would request the next row from the outer side child, then rewind our data access operator and iterate it again. Rewinding a data access operator causes it to reset its internal position state and will cause it to start again from the first row on the first page. · On first next() call the operator has to Seek (find) the first row that has the key requested and return it. SQL Server stores metadata about B-Trees that describe exactly which pages belong to an index but, unlike the Heap case when it has to go to the first page, the operator has to navigate to a specific key. From the metadata it retrieves the root page id and then request a reference from the Buffer Pool for this page. Using the searched key value, the data access operator navigates the B-Tree too reach the leaf page that contains the first row equal or after the searched key. At each step down the B-Tree the data access operator must request the relevant page from the Buffer Pool and possibly wait for it to be read from disk. On the leaf page the data access operator will have to search the rows in the page to locate the one with the desired key, copy out the desired column values and then return. It is possible that the data access operator does not find a row with the key value searched for. The B-Tree access can request an exact key value for the row, it can request the first row after the key value or it can request the first row equal or after the key value. A B-Tree can be searched in both direction (ascending or descending) so the definition of a row ‘after’ the key depends on the direction of the search. Not that this is not the same thing as having the index defined ascending or descending, which means change the actual order of rows in the B-Tree. · If the operator is used as a range scan, then next() will be called again asking to retrieve the row after the previously returned one. The B-Tree access operator would store the key value it returned previously and position itself on this key value, using the same procedure to navigate the B-Tree as described above, and then move to the next row. If there are no more rows on the page then the operator would return the first row on the next page (again, asking for the next page from the Buffer Pool and possibly having to wait for it to be read form disk). In B-Tree organized indexes the pages are linked, each page has on it a pointer (the page id) of the next page. · Range scans can contain and end range key value. In such case the call to next() may return false (not return a row) if the row located by moving to the next row from the current position is greater than the range end value. The term ‘greater’ is relative as the range scan can traverse the B-Tree in both ascending or descending order and the B-Tree itself may be organized ascending or descending. The operator can end the scan either when it reaches a key positioned after the end of range value, or when it reaches the last row on the last page of the B-Tree. · In addition to being rewind, B-Tree operators can also be rebind. A rewind resets the operator state to start again the seek/scan with the same key/range parameters. A rebind will change the actual key values. See Showplan Logical and Physical Operators Reference for more details. From the description of how scan operators operate you can see that every time they finish reading all the rows on a page they have to ‘fix’ the page into the buffer pool and this potentially can stall the operator as it has to wait for the page to be fetched from disk into memory. If the operator has to stall at every page, performance plummets. The solution is to read ahead pages that are not referenced by the operator now, but will be referenced soon. SQL Server does this and issues asynchronous read ahead requests for pages that will be required by the scan operator before the operator actually reaches that page to read the rows. Luckily by the time the operator reaches that page the page is already in the buffer pool and ‘fixing’ the page is nearly instantaneous. For more details see Reading Pages,Sequential Read Ahead. There exists also a special kind of read ahead for reading random pages for a nested loop, see Random Prefetching. For a detailed discussion about latches read theDiagnosing and Resolving Latch Contention on SQL Server whitepaper. Whenever a query operator needs to access a page (eg. to compare a key, or to read a row) it must acquire the page latch in SH mode. Multiple operators can read the same page concurrently as multiple threads can acquire the page latch in SH mode. Any operator that needs to modify the page must acquire the page latch in EX mode. Only one operator can modify the page at a time, an no other operators can read the same page until the modification is complete. These two types of requests show up in the wait stats was PAGELATCH_SH and PAGELATCH_EX wait types. The Diagnosing and Resolving Latch Contention on SQL Server whitepaper has more details, including on how the page latch also protects IO requests (so that the page is only read once from disk even if multiple concurrent threads need to fetch it from disk) and also how high end multi-CPU systems use superlatches to avoid processor cache invalidation. It is important not to confuse the physical page protection offered by latches with the logical protection of locking. Locks can be controlled by the client (eg. by choosing a transaction isolation level) but latches are always required. A detailed description of this process can be found at SQL Server 2000 I/O Basics. · The write operator is ‘positioned’ on the page that has to be modified (a row has to inserted, deleted or modified on the page). This means that the page must be ‘fixed’ in the SQL Server cache. · The operator must obtain an exclusive latch to the page. This guarantees that no other operator can read this page. · The operator must generate a log record describing exactly the operation is about to perform on the page and append this log record into the log. · The operator can now modify the in memory cached image of the page. · The LSN generated for the log record created before the page was modified must be written into the page header as the ‘last modified LSN’. · The page exclusive latch is released. The page can now be read by any other operator. Is important to understand that until now no disk write occurred yet, everything is just modifications done in memory. · Before the transaction that did the modification commits it must generate a new log record describing the fact that this transaction is committed, this log record is appended to the log and all log records in memory, up to and including this commit record, must be written to disk. By definition this will include above log record that describe the modifications done to the page. Note that the page is still only modified in memory and not written to disk. At this moment the transaction is durable because if the server crashes the modification done to this page is guaranteed to be described in the log, saved on disk, and the recovery process will redo this operation if necessary. · Periodically the modified (‘dirty’) pages in the SQL Server cache are written to the disk. This is called a‘checkpoint’. · The operator doing the minimally logged operation (a bulk insert operator) allocates a new page. SeeManaging Extent Allocations and Free Space to understand how pages are being allocated. · The operator ‘fixes’ the page in the cache and obtains an exclusive latch on it. · A log record is generated describing the fact that the page is being used for minimally logged bulk insert. This log record is appended to the log (in memory) and the record LSN is written on the page as the last modified LSN. · The page is added to a list of minimally logged pages associated with the transaction. · The operator can now add as many rows as they fit on the page. I does not need to generate any log to describe each row. Only the in memory image of the page is modified, no disk write occurs. · When the page fills up a new page is allocated and the process described above repeats. · Before the transaction that did the minimally logged operation commits, all the pages modified in minimally logged mode by this transaction must be written to disk. After all the pages were written to disk, a new log record record describing the fact that the transaction committed is generated and appended to the log (in memory). All the log up to and including this last log record must be written to disk now. · To prevent a ‘thundering herd’ phenomenon of all pages modified by the minimally logged operation attempting to write to disk at the same time at the end of the transaction an eager write process is writing them to disk even before the transaction is committing. Minimally logged operations are still fully transactional, consistent and durable. Up to the last moment the operation can be aborted (rolled back) or the server can crash and the database is left in a consistent state (after recovery). Just as with the fully logged operations, a detailed description of this process can be found at SQL Server 2000 I/O Basics. Not all T-SQL statements are executed as an iteration of operators in a execution plan tree. The typical example are DDL statements, like CREATE TABLE. To understand how DDL statements work, is important to understand that SQL Server stores all the metadata about any object in the database in internal system tables.An insert into the system tables that describes the existing tables will result in a new table being recognized by SQL Server. An insert into the system table that describe columns will add a column to a table. Deleting a row in these tables it means the table object or a column of a table gets dropped. Everything inside the database is described by these system tables, there are about 80 system tables that cover objects, procedures, functions, schemas, users, logins, certificates, views, partitions, permissions, databases, files, literally every SQL Server concept. Therefore what DDL statements have to do is just to maintain these system tables. A statement like CREATE TABLE has to insert a row in the system table describing objects (tables are just one of the possible object types) and some rows in the system tables describing columns and voila, your new table was ‘created’ (Keep in mind I’m simplifying a great deal). While DDL statements do not use directly the operators that I mentioned above, they do use the same code to effectively access the system tables (read rows, write rows). When a DDL statement executes it does not call next() on an Seek operator but instead is using directly the code that the said Seek operator would had used to locate the row it desires in the system table. The DDL statement accomplishes its work by inserting, deleting or updating rows in these system tables. A few DDL statements have additionally do some operations outside these system tables, eg. they have to create or delete files on disk for the database, or they have to connect to Windows Clustering API to configure Availability Groups. And some DDL statements have to manipulate the data tables internally, eg. to populate the default values of a new column or validate that the existing data conforms to a newly added check constraint. After we sift out the query statements (including DML) and the DDL we’re left with a few special statements. BACKUP and RESTORE operates by bypassing almost everything we discussed so far. From a 10000ft view what BACKUP and RESTORE ultimately do is just a glorified copy from one file to another. BACKUP reads from the data and/or log files and writes into the backup file. RESTORE reads from the backup file and writes into the data and/or log files. They do need to do some housekeeping of system tables, but the bulk of work they simply read from a file and write into another. In doing so they bypass the data cache (the buffer pull). As for DBCC statements, pretty much each one does something different. For an example of how DBCC CHECKDB works I recommend reading the series of articlesCHECKDB from every angle. How can I use all this information? Developers that interact with databases have two main pain points: troubleshooting performance and troubleshooting data loss issues. This article will not help you much with the later, if you do not have a backup, nothing will save your, sorry! But I hope that understanding how things work will shed some light into the performance troubleshooting problems. Once you understand that your client is sending requests to the server and the server is creating a task for for each request, the performance conundrum can be simplified a great deal: at any moment your task is either executing (consuming CPU cycles) or is waiting. And every time it waits, and I mean everytime, the wait information (what was waited on and how long) will be collected by SQL Server internal wait info statistics. There is an excellent methodology on how to leverage these wait info collected statistics to troubleshoot performance bottlenecks: the Waits and Queues whitepaper. If you follow one link from the many I referenced in this article, it better be this last link.